I saw the scene in my mind while listening to the song, and after some sleuthing on the Internet, discovered an image of a music box from the correct time period that fit how I envisioned it in my mind. It's my birthday, and my mom got me the music box! Check out this video I made of it. "Minuet" wasn't available, so instead they're listening to "Music of the Night" from Phantom of the Opera. Now, as a reminder, here is the "Music Box Scene" in Remembrance! There was glass on the top and front sides, and the rest of it was a medium-colored wood. 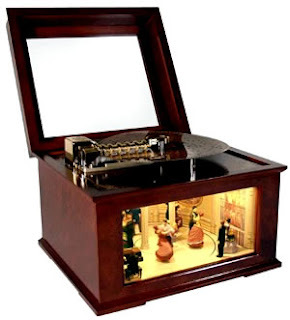 It was divided into two sections—the top was an inch tall and opened to reveal what appeared to be a miniature golden record player with small raised dots scattered on the disk. I kneeled to see what was inside the larger section, my lips parting in surprise at the scene inside. Porcelain figures appeared to be dancing inside a miniature ballroom, and while they weren’t actually moving, it looked like they were dancing to the imaginary music of a pianist in the corner. The yellow walls displayed elegant carvings, and the floor was an off- white marble, the lightness of the room making the space appear larger than it actually was. The women’s flowing dresses created movement in the still piece. It was like the dioramas that I made in elementary school, only much more detailed and elegant. “It’s beautiful,” I said, lifting my fingers to touch the glass, like I was trying to reach into the scene. The gold plate on top started slowly spinning, sending clear notes through the otherwise silent room. A section of the floor inside the box rotated when the song began, making it look like the figures were dancing to the music. “It’s ‘Minuet.’” I recognized the piece instantly. The conversation I’d had with Jeremy in the beginning of the school year popped into my mind. At the time I didn’t realize why I cared so much that Jeremy and I didn’t have a song, but now I knew why. Music is powerful; it transforms emotions and experiences into something tangible. Every time you hear a familiar song, the feelings from it bubble to the surface, bringing back memories you might have otherwise forgotten. Sooo prettyyy! This is such a prety box! now i understand completely how it looks like!! 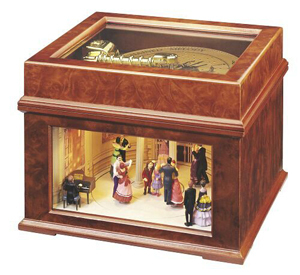 Such a beautiful music box, I would love one like that. But modern day rap is an integral part of the hip hop culture, with the two terms often being used interchangeably.